“The Gay Press is fully recovered from the recession,” says Todd Evans, President and CEO of Rivendell Media. The Gay Press, once thought to be recession proof, was dramatically effected by the 2009 recession and spending (which had been always trending up- sometimes dramatically) showed wide swings from its all time high in 2009 to almost a 50% spending loss in 2010 back to another wide swing up in 2011 and is again approaching its all time high. Rivendell Media, the leading media representation firm for most LGBT publications in the US, reports that spending for 2013 should reach a new high based on strong first and second quarter sales. LGBT advertising revenues have grown a robust 377% since 1996, demonstrating that ad revenues in the gay and lesbian press grew more than ten times faster than that of consumer magazines. 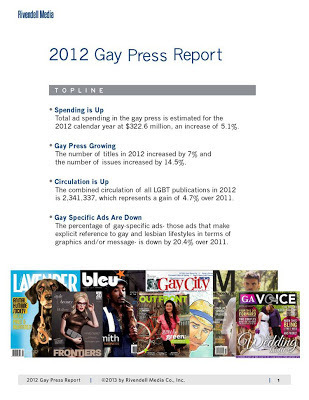 In 2012, the gay and lesbian press consisted of 205 issues (26 more than in 2011), representing 122 individual titles, an increase of 8 titles since 2011. The combined circulation of all LGBT publications is now 2,341,337, which is up 4.7% from 2011. Rivendell Media (www.rivendellmedia.com ) is the leading LGBT media representative firm in the United States. 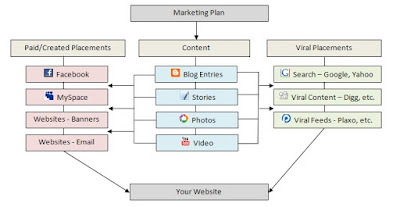 Rivendell Media was founded in 1979 and is now in its 34th year of business. Rivendell represents over 200 LGBT publications, websites and digital properties in the US and Canada.